The first decision will be in respect to the form of archery you want to participate in. You have the choice between indoor archery or outdoor archery. 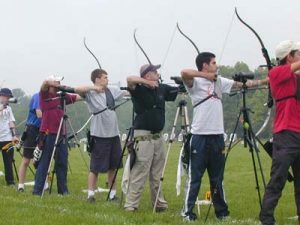 You will find that you have options to participate in this sport by attending ranges, or you can go on wilderness archery sports ventures. In most cases, those that are just entering into this sport will want to start with target archery. Make no mistake by thinking that this a mundane way to become involved in this sport. This is the style of archery that is played at the Olympics. The objective of this form of archery is to aim for the bullseye on the targets. This is the archery Robin Hood made popular. It takes place outdoors. It still involves shooting at targets and not live prey incidentally. The difference is the archer has to become adept at shooting in different terrains and meet the challenges of shooting from different angles. Here the participant gets to shoot at fake animals made out of foam 3D materials in a natural setting such as woods or forests. The skill levels and challenges are increased as the participant masters the different levels. For those who like to stick to the basics of archery, it means remaining with the traditional methods that have been used for many years in the past. This involves using a traditional bow and arrow with the standard techniques. Within the field of archery, it also includes bow hunting. This is reserved for those that want to use archery as a form of hunting for the supplying of food. It can also include bow fishing.